The only official currency in Belgium is the Euro (symbol EUR). You can look up exchange rates with your local currency on the website http://www.x-rates.com/. There is only one large international airport in Belgium. It is called ‘Brussels airport’ and it is situated in Zaventem, one of the suburb villages of Brussels lying north-east of Brussels. The official homepage of Brussels Airport is: http://www.brusselsairport.be/en/. This website always shows the local time and weather conditions. Some low-cost airliners fly to ‘Brussels South’, but this is misleading, because the actual airport ‘Brussels South’ is located in the city of Charleroi which is about 56 km south of the centre of Brussels (http://www.charleroi-airport.com/). This is about the same distance as from Brussels to Ghent ! The national airliner of Belgium is “Brussels Airlines” (joint venture with Virgin Express). The website is: http://www.brusselsairlines.be/. The best way to travel from Brussels Airport to Gent is by train. Because the distance between Brussels Airport and Gent is about 60 km, a trip by taxi is very expensive (about 100 EUR). The airport train station is located below the airport terminal (basement level -1). Up to 4 trains an hour connect the airport to Brussels North, Brussels Central and Brussels Midi stations. Moreover there are direct train services to Gent. The main train station in Gent is called “Gent-Sint-Pieters”. 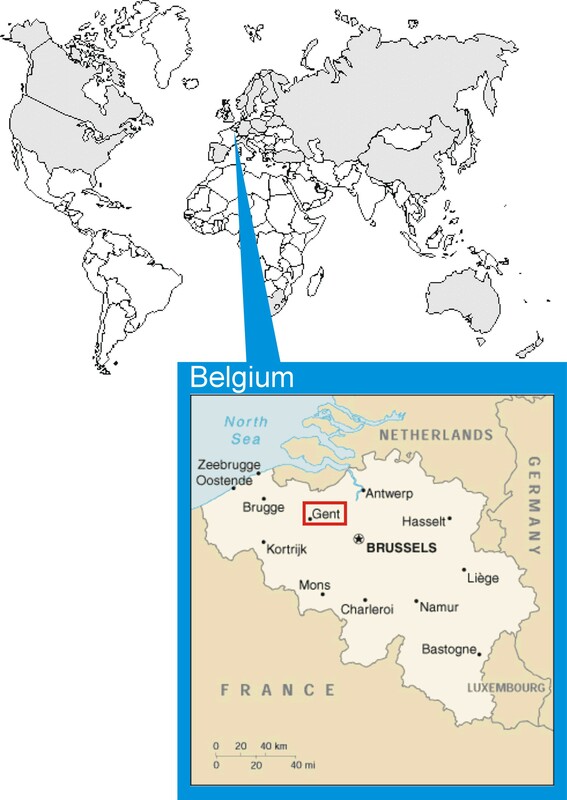 In English, Gent is written as “Ghent”, but in Dutch, it is “Gent”. You can buy your ticket at the ticket desk near the entrance of the airport train station. You do not need to make any reservation for these trains. Information on the schedules of all Belgian and international train services can be found on the Belgian Railways website http://www.b-rail.be/main/E/. Enter “Bruxelles Nat Airport” as departure station and “Gent Sint-Pieters” as arrival station. The average travelling time is between 49 minutes and 57 minutes (depending on the train schedule). Always take a direct train that only stops in “Brussel-Noord”, “Brussel-Centraal”, “Brussel-Zuid” and “Gent Sint-Pieters” (so-called IC/IR – InterCity/InterRegion). Some other train connections to “Gent Sint-Pieters” ride via “Aalst” and stop in a lot of small stations in between. Then it will cost you about an hour and a half to get to Gent. Keep in mind that the last direct train connection from Brussels Airport to Gent Sint-Pieters at night is at 23:04 and the first in the morning is at 05:52. If you would arrive at night, you will need to take a taxi, because it is 65 kilometres from Brussels Airport to Gent. When you arrive in the "Gent Sint-Pieters" station, proceed as explained below. The railway station Gent Sint-Pieters is situated about 3.5 km north of the campus. The main entrance of the station is located at the Koningin Maria Hendrika square. The backside of the station gives out onto the Voskenslaan (indicated with a red dot on the map below). From the railway station Gent Sint-Pieters, there are regular bus connections to the campus. Lines 70, 71 and 72 have a bus stop in front of the campus (bus stop "Bollebergen"). In front of the station, there are always taxis waiting. Taxis can also be reserved from the taxi company V-tax (tel. +32-(0)9-222.22.22). 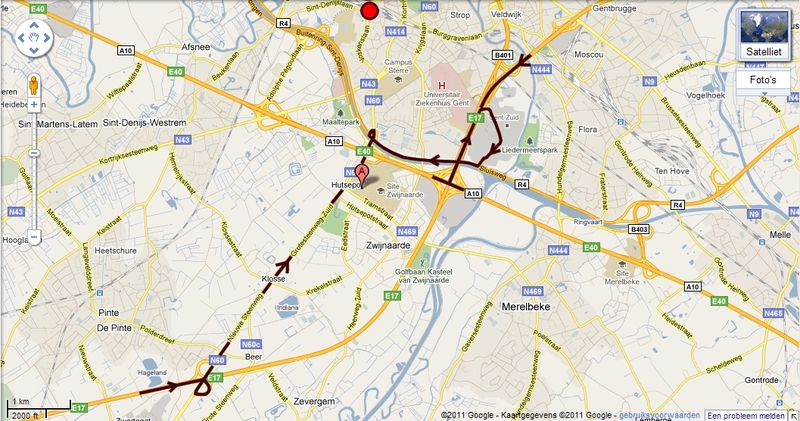 Ghent is located at the crossing of the motorway E40 and E17 and is very easily accessible by car. You arrive at a long-stretched roundabout, shown on the top left corner of the figure below. You take the exit for the campus "Technologiepark Zwijnaarde". Next, you drive like indicated on the map below with yellow dots. 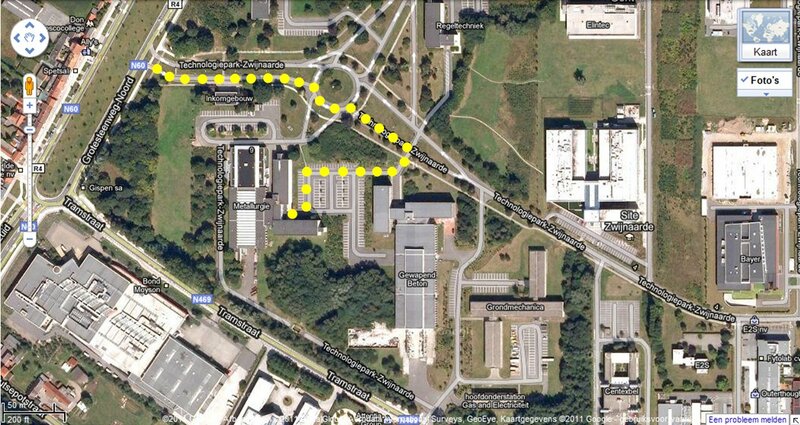 There is a large parking in front of the building 46. The main entrance of the building 46 is situated in the corner of the parking, diagonally opposite to the point where you drove into the parking area. The main entrance of the building 46 looks like the picture below. Our research group is located on the first floor in the right wing of the building 46.